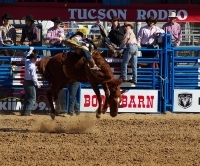 A popular event held in early spring is the Fiesta de los Vaqueros (the Tucson Rodeo). While the Fiesta is a sporting event, it includes what has been declared the world's largest non-mechanised parade. Join a crowd of more than 200 000 people to enjoy the wild west-themed floats, horse drawn cariages, Mexican folk dancers, marching bands, and the riders who will take part in the rodeo. The parade still keeps the spirit and style of the first event back in 1925. The Rodeo Parade is such a popular event that schools give two rodeo days off instead of Presidents Day. Traditional Western attire is seen throughout the city during the Fiesta, marking the beginning of the rodeo season in the United States. This is the premiere event of the rodeo year is not to be missed.